During the holiday season I got a gift for Chanukah that combined some of my passions, cooking, hockey and the Toronto Maple Leafs. What did I get? A grilling cookbook by NHL Hall of Famer Borje Salming and former Toronto Maple Leaf. His cook book is called Grilling With Salming . It is nothing too complex, pretty simplistic and a lot of it looks great. There are some recipes that have ingredients that are not all that readily available, probably because they are ingredients more available at his home in Sweden. Most recipes are naturally gluten free. Anyways, I wanted to share with you the Salming's Steak Sauce on page 104. I didn't have all teh ingredients, so I made some modifications for mine. 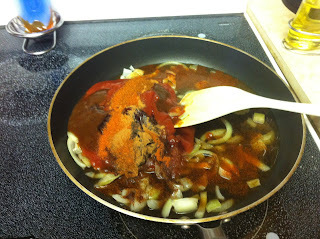 His Steak Sauce recipe essentially takes HP Steak Sauce and enhances it. Top on grilling steak in last 5 minutes to caramelize.